How to perform with music keyboards and sing at the same time. Performing with Music Keyboards: Normally when preparing for a performance most people only have to worry about their voice. Just because you may be rooted to one particular space on the stage does not mean you can’t engage the audience and get them on your side. 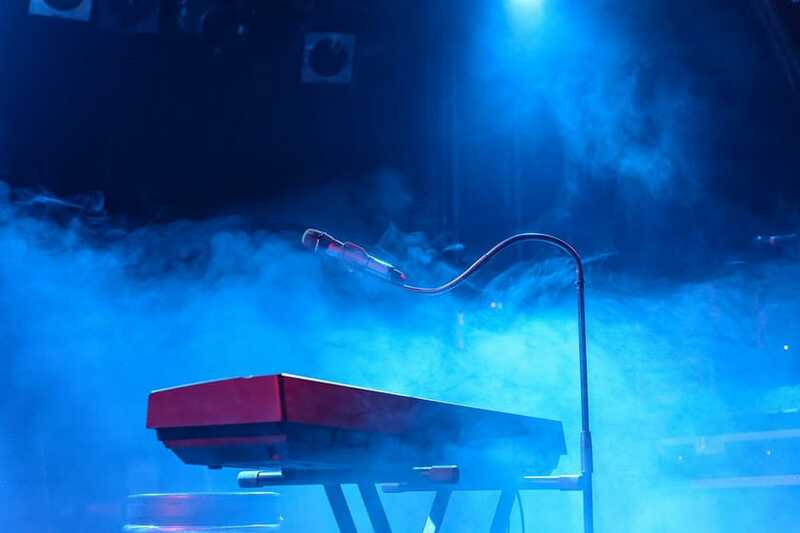 What will really set you apart from other performers is the way you can still communicate your message through eye contact, facial expressions and really putting your back into it, regardless if there’s music keyboards between you and the audience. You need to express the emotion in the song so if appropriate don’t be afraid to kick your chair back and stand up, the more passion you give and the more you enjoy it the better the performance. If you have to keep looking down during your performance, and have nothing but a blank expression on your face then perhaps you not stage ready. HOT TIP! Remember that there are huge resources at your fingertips, study other performers live performance on YouTube or your favourite artist at a concert. Start to pick up what works and what doesn’t for various performances. Then try and test them out yourself. It’s very important when performing with music keyboards that you have the right posture. Whether you decide to sit or stand, you should retain a flexible feeling in your spine. If you do slump, your breathing and control of breathing will be affected, which will essentially impact your vocals. To stop this try not to lean forward, your ribcage should stay in its rightful position and not collapse forward. Do keep in mind that you don’t want to be too rigid as this will look unprofessional. Just because you have music keyboards in front of you doesn’t mean you cannot still get into the song and enjoy yourself. If anything the movements you make are even more crucial as it is limited. You want the audience to be on your side, and not feeling disconnected just because there’s an instrument between you. HOT TIP! Making sure your mic is in the right position is paramount to making sure you keep the right posture. You want to make sure the mic is close enough to your mouth so you don’t have to lean, and high enough to make sure your spine stays tall but not covering your face so the audience can’t see you expressing the song. Just because you are playing music keyboards doesn’t mean your vocals should suffer. Try not to tighten your shoulders, neck, or jaw as you perform as this will tighten your throat as this can lead to poor vocals and breathing control. If you choose to sit when playing the keyboard, a good way to maintain power is by sitting on the edge of your seat and squeeze your bum against the seat. This way you will get as much power to your voice as if you were standing. HOT TIP! You must remember that your voice takes priority and playing music keyboards should be secondary. If you’re not 100% confident in playing the piano then you need to keep practising before hitting that stage. If you can’t play without having to think about the next key then this can lead to an awful performance.